Join us on December 20th at 8 PM at Chez Boris, in collaboration with The Wandering Chew, for a Chanukah party dedicated to the little-known tradition of eating dairy on this holiday. This tradition is all thanks to Judith, one strong and badass woman (if we say so ourselves). The story goes that the Assyrian General, Holofernes, laid siege to the town of Bethulia. One night, admiring Judith’s beauty, Holofernes invited her to his tent. Judith took this opportunity of carry out her plan of killing the General. She fed him salty cheese that caused him to become thirsty and drink copious amounts of wine. He then fell asleep in a drunken stupor, at which point Judith used his sword to cut off his head. 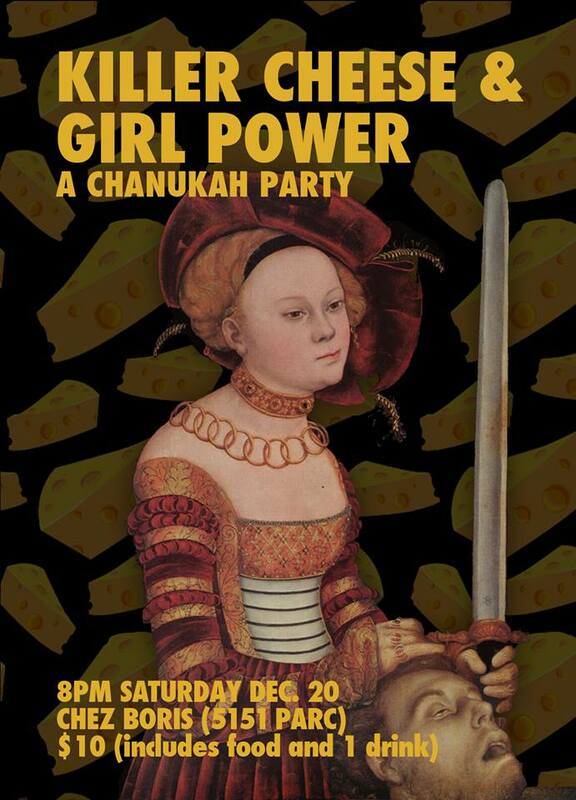 Join The Wandering Chew and Roots & Recipes for a night of cheese and girl power (don’t worry we won’t oversalt)! You’ll get to taste dairy dishes from different Jewish communities, all while listening to a soundtrack of tunes that would give Lilith fair a run for their money. Ashkenazi cookies made with cream cheese and filled with raspberry jam.